« Ich arbeite bis zu meinem Ende, kein Problem! Before the war, 14,000 Jews lived here and there were twelve synagogues, as the musician Alfred Schreyer tells us in the darkness near the Drogobycz disco where we are in constant danger of being run over by some wild and rowdy youngsters in fat cars. It is Saturday night. In the little town of Drogobycz in Western Ukraine, street lamps are turned off at 10 p.m., and suddenly it is very dark between the old houses. Schreyer, 83-years old, is one of only two Jews born in Drogobycz who still lives here: all the others are in their graves or have emigrated, says Schreyer. This elegant, fragile man, speaking a refined German, endured wartime in the forced labor-camp of Gross-Rosen. His mother is lying in a mass grave in Stralovic, in the Bronica Woods. His entire family was murdered in the gas chambers. The Vienna Jewish Choir and the Viennese Klezmer band Scholem Alejchem are on concert tour in Western Ukraine. After a nearly 24 hour bus journey, some of the singers are nearing collapse while performing in the local Philharmonic Hall. But they draw out the concert: the elderly residents have been awaiting their performance for a long time. A little red-haired boy in the first row is obviously ready for bedtime. Finally, he tries to crawl on his mother’s lap, but she resolutely pushes him back into his plush-covered seat. At the moment, the community comprises 250 members, including spouses. They have come from Eastern Ukraine, the Ural region, and other parts of the former Soviet Union. 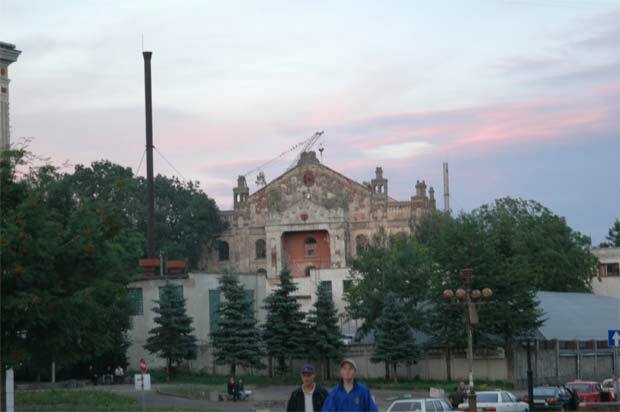 The enormous outline of a big Synagogue floats over the city as the roof is repaired with the help of a crane. It once was a prayer room for 2,500 persons. The building is in ruins because it served for years as a shelter for the homeless, who warmed themselves by lighting fires inside the Synagogue. With the help of the foundation Or Avner from the United States, the building is being „remontiert“, „it is an expression you do not have in German“, smiles Schreier. The Jewish charity „Chessed“ supports Schreyer’s personal „remont“, once a month he receives a food package and can visit a restaurant. „Tomorrow we are going, four men all together, to Lemberg to play a concert for the former chairman of the Israel Knesset, Shevach Weiss. I am singing songs by Mordechai Gebirtig and old polish tangos“, Schreier tells us with pride, before he begins carefully to negotiate his way home over the rugged sidewalks. Here, he knows every stone on the road. Jossef Karpin, president of the Jewish community in Drogobycz, displays the sudden bursts of motivation and urgency characteristic of teachers. „It is a miracle that Mr. Schreyer has survived. Here, we have only a memorial stone for the murdered Jews, but fifteen kilometers from here, in Bronica, there is a memorial, that was an execution place. Up to 15,000 people are buried there.“ Karpin wants to support efforts for a memorial in his city. Young Jews are emigrating because there is no work here. „It is worse than before Perestroika, because at that time, industry was state-owned and in wood-processing, in furniture plants or in the petrol-industry people could find work. Now, two thirds of the enterprises have been closed down. The Kolkhozes have been dissolved. What do I need freedom for, if there is nothing to eat?“ Karpin is laughing into his neatly trimmed grey beard. „But education and knowledge are highly valued, which is a hopeful sign“. A heavy grandfatherly type in a dress shirt presents a white basket of red roses to Mirjam Silber, the singer of „Sholem Alejechem“. He recalls how he liberated Vienna from the National Socialists sixty years ago, on 26 April 1945. „Something the Austrians like to forget“, a member of the Choir comments rather loudly in German from the balcony. The old man saved some of Vienna’s famous architecture from being blown up. The Nazis had left them mined. In the crowded theater on Shepetivska street in Ukrainian Czernowitz, the elderly audience patiently remains in its plush-and-gold seats, because a thunderstorm is breaking outside. „We are in love, but our love-affair is not going to be fulfilled, dear God in heaven, help me, we could not bring our love to an end.“ The sad song „Oi dortn, dortn“ tells of a doomed love affair. Outside, bucketfuls of rain pour down. In „Mother’s Shabbat Song“, an old folksong that Isaak Loberan heard from the old singer David Saposchnik, all that remains of people are songs – they are shining like stars in the night. Nobody has remained, everything is far away. Bullets fly like swarms of bees. The Jew has been exiled. Only memories remain and the stars at night. Saposchnikov himself died recently from cancer, one day before his Kiev concert. The tango „If I should lose you“ is another piece the band adopted from him. A grandfather, dressed in Jersey-shirt and fitting popeline-cap, is nervously mangling his wife’s handbag. Afterwards, the local heroes are playing, the Czernowitz band „A Jiddische Neschome (A Jewish Soul)“, dressed in flashy green and gold disco-shirts. The trombone-player looks like a Ukrainan Elvis Presley, the mustached clarinetist might as well be commandeer of the local fire-brigade. The young percussionist is sitting in his golden stuffed chair, leaning backwards and not even once looking whether he is actually hitting his drums and cymbals. Klezmer rock, the audience cheers. Like a circus band, „Jiddische Neschome“ evokes a sense of happiness. There is music sounding. In the market place in Belz in Moldova, in small streets packed with textile stands, a blind accordion player is passing through, making tiny steps with the regular rhythm of his instrument, his skinny wife, red headscarf knotted in her neck, is holding on to his back. A kind of cup is fitted to the front of the accordion, into which people, whom the blind couple is passing by, put little bills of money. They are not saying thank you, because they cannot notice the people putting money into their cup. In the market hall with the high vaulted roof, honey glasses are stapled high in various shades of gold. If you want a taste, some honey is being put onto your hand with a knife and you have to lick it off. Behind a counter women in white lace hats, selling bread and cakes and posing as soon as a camera appears. Cucumbers pickled in honey are considered a specialty to soften the Vodka. An old man in grey suit, grey hat and with grey beard sings very loudly and with self-confidence in front of a fountain, some melodies which sound like Jewish songs. Some steps further, in the central square of Belz, the memorial with a tank on it. On nearly every corner, elderly women selling newspapers are to be seen, wearing dark green outfits, headscarves knotted in the neck and gold rimmed glasses. Youths are drinking malt beer already that early in the morning. With the help of a taxi, we try to find the synagogue. The taxi driver, a military-looking type with naked chest is excited about the adventure, his brother in the seat is studying the city map, the wireless radio keeps repeating in staccato “house number six, bridge so and so”. We make our way between deep puddles, over muddy, unpaved streets, ask a woman, who has hung up her carpets on the garden fence to clean them down with a garden hose. This results in lengthy explanations. Finally at the synagogue, a beautiful entrance room with glass windows in yellow and light green. Candles are burning. “Gut Shabbes” is the greeting which receives us. Behind a fence, the chicken of the Jewish community are clucking. “We have here only about 80 old people, the young have emigrated to the United States, Germany or Israel”, the rabbi explains, holding his white and blue Kippa, friendly looking at us over the rim of his glasses. Inside, in the prayer-room, the place of the women is separated by a light blue curtain. Once, there were 68 Synagogues in Belz. The taxi drivers are waiting in the meantime, one of them has dared to enter the garden.